Addison & Chris have a love that is impossible to put into words. You hear of this kind of love in fairytales and try desperately to quantify or replicate it, but it simply cannot be described. From the moment she laces her hand into his, their love can be felt. 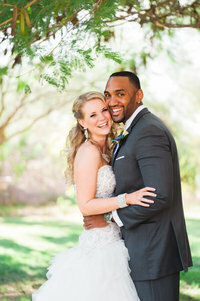 These two were married on April 7th, 2017 in Cave Creek, Arizona and had their reception following at the Wright House in Mesa! Their wedding day reminded us so much of our own! We also got married in Drew’s home church and loved every minute! 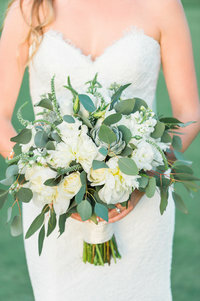 Addison’s bridesmaids wore beautiful mint lace dresses and held simple peach bouquets. Chris and his groomsmen kept casual in blue denim and neutral vests! 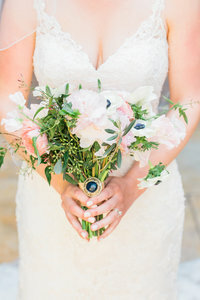 The reception decor was absolutely beautiful, with white lace table linens and towering arrangements of eucalyptus leaves and peach garden roses! Addison & Chris injected the entire day with whimsical details, while focusing 100% on their guests having the best night! They filled the Wright House with love & laughter; surely a night everyone will remember! 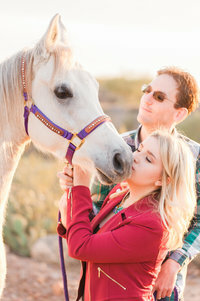 Thank you, Addison & Chris, for trusting us with this incredibly special day! We were truly honored to have been a part of it and we know that your marriage will become more than you’ve ever imagined! 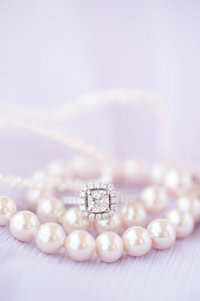 If you loved Addison & Chris’ wedding, you may also like our other weddings!